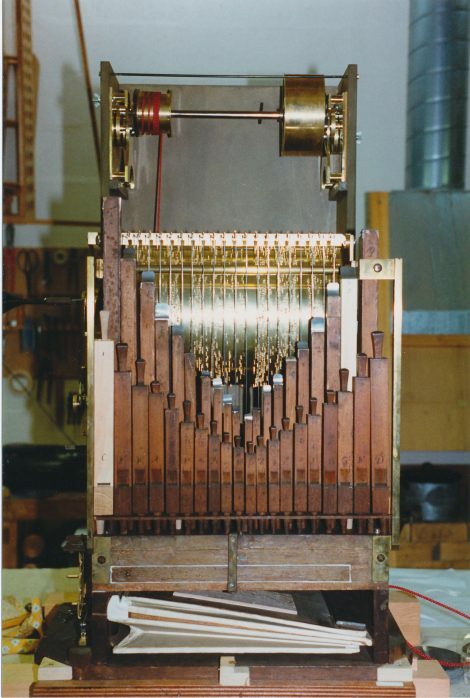 The clock, or ‘machine organ’, was made by Charles Clay, during the 1730s. He died on February 25th 1740, and on August 27th 1743, his widow advertised a performance on this clock, called “The TEMPLE and ORACLE of APOLLO”. It took its name from a silver mounted rock crystal casket made in Augsburg in 1664, which originally had a statue of Apollo on top. Clay made a speciality of assembling spectacular pieces, with clocks, clockwork-driven barrel and organ, and music composed and set by Handel, Geminiani, etc. The organ part may have been made by a workman associated with the Jordan workshop. It may have been bought by Frederick Prince of Wales and Augusta, Princess of Wales, who possessed two other ‘machine organs’. There are pictures of the clock at Kensington Palace in the early 19th century, in the Green Drawing Room at Windsor Castle ca1830, and in the Grand Corridor at Windsor ca1900. The casket is now surmounted by St George and the Dragon, and contains General Gordon’s Bible. The organ was restored in 1904. Inside the bellows is a pencilled note; “Re-leathered by A. Milhouse Oct 25 1904”. In 1994-5 it was restored by Stuart Dobbs (organ) and Peter Ashworth (clock and barrel mechanism). There are three ranks of pipes, Stopped Diapason, Open Diapason and Flute, all made of made of pine, with oak blocks, caps and stoppers. There are twenty pipes from c¹ to c³ (c d e f f# g a bb b c c# d e f f# g a bb b c). The pitch marks are in ink on the pipes above the bevel. The barrel mechanism and its clockwork are beautifully made. Anthony Hick identified eight out of the ten tunes, including airs from Handel’s operas Serse, Arianna, Ottone, and Ariadne. The arrangements are simplified, and the pitch of the organ a major third high.